Charles Darwin predicted that the fossil record would reveal transitional fossils, showing intermediate features between the different types if animals. If everything evolved from ‘lower’ orders, then we should indeed find fossils that show traits of both modern and ancestral (ie if birds evolved from reptiles, we should find birds with reptilian features, and/or reptiles with avian features) forms. Worth noting of course, is that such a finding would seriously contradict the Biblical notion of the contemporaneously “created kinds.” Because of this, existence of transitional fossils has become probably the biggest target of anti-evolution propaganda. Nothing epitomizes the unethical treatment and utter abuse of painstaking scientific research and publication by the anti-evolution movement like their incessant claim that transitional fossils do not exist. These arguments range from playing on semantics, ignoring important discoveries, cherry-picking scientific literature, and quote mines (you’re not surprised are you?). Rather than try and list every instance of transitional fossils (see list here), I will focus on the reptile-avian relationship, and expose the laundry list of straw man arguments employed by the evolution-denier movement. It’s important to note what we mean by transitional fossils. In general, it’s a fossil that shows traits of two types (evolution deniers are generally vague about the meaning of ‘types,’ for the point of this blog, we’ll use it synonymously with orders) of animals, as though it were an intermediate between the two. 1869 marks the discovery of the first such creature. Discovered in Germany, Archaeopteryx lithographica is a bird with reptilian features not found in modern birds, including a long bony reptilian tail (with many vertebrae), teeth, a reptilian mouth, a neck that attaches to skull from the rear (not below), etc (see full list here) (Nedin). This is important to keep in mind because evolution-deniers generally cite its avian features and ignore its reptilian features as though they didn’t exist. Archaeopteryx appears in the late Jurassic, which is where we’d expect a transition between reptiles and birds if the latter evolved from the former. Archaeopteryx appears well before more modern birds, but well after reptiles first appear in the Permian (320 MYA). Theropod dinosaurs (ie like Velociraptor), appears in the Triassic (230 MYA). The general consensus is that birds evolved from theropods, but a small yet vocal minority argue that they in fact, descend from another class of reptiles (more on this below). It’s also important to note that Archaeopteryx is not the only transitional fossil to be found. A number of other fossilized birds with reptilian characteristics have been discovered, as have feathered theropods. In fact, the line between feathered theropods and birds has becomes blurred as discoveries continue. Taxonomy is the classification of things (though in this case we are speaking of its application to living organisms). This is what gives us the ability to categorize organisms into an organized structure for better study. It’s important to note that the vast majority of species that ever lived have gone extinct, so existing fauna are really just a small sampling compared to what the Earth’s history has harbored. It’s also important to note is that Paleontologists generally classify birds as avian dinosaurs (UCMP Berkely), and that new taxons like “dino-birds” aren’t created each time a new gap is filled. Keeping these in mind, we can wade through some of the more common anti-evolution misunderstandings. One of the arguments is that Archaeopteryx is a “fully formed bird.” Of course, this lends no credence to their argument since eagles, hummingbirds, penguins, ostriches, condors, kiwis, and dodo birds are all “fully formed birds” and yet they themselves constitute a diverse class of vertebrates. However, of the fauna that we can currently observe and study, they bear more resemblance to one another than reptiles or mammals. Another common tactic is to cite other early fossilized birds and the reptilian traits they possess. For example, there are other early birds that have teeth (though no modern bird that we know of possesses ssuch). What many anti-evolution sources do is point to this in order to argue that, teeth are also an avian trait. The fallacy in this argument should be obvious; these too are transitional fossils (early birds that retain reptilian characteristics not found in modern birds). Alan Feduccia is a professor of Paleobiology and North Carolina Chapel Hill (UNC at Chapel Hill). His view is that birds actually evolved from non-dinosaurian archosaurs (meaning a different line of reptiles than what most Paleontologists believe). Yet, anti-evolutionists quote mine Alan Feduccia as though he were a Young Earth creationist, completely ignoring what it is that he is actually saying. 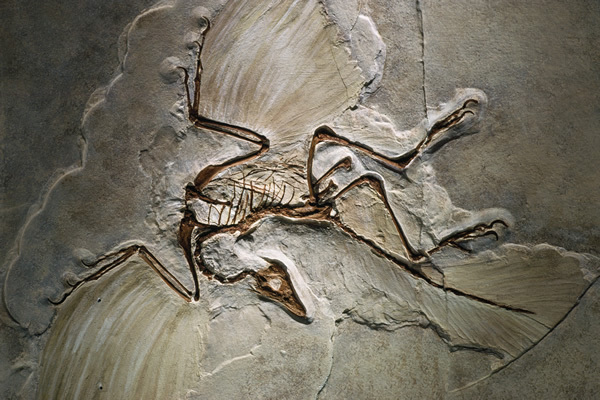 Whether birds evolved from theropod dinosaurs, or another line of reptiles, the reptile-avian connection is still true, and Archaeopteryx is still a bird with reptilian features. Also important to note is the way anti-evolutionist sources portray Alan Feduccia as though he’s the only avian expert in the field. In reality, it’s his contrarian viewpoint that highlights his stance and since most Paleontologists agree on the theropod ancestry, there is little to make them stand out from one another, at least in popular science publications like National Geographic. The perception of ‘balance’ in the media tends to distort the truth, given that they tend to give a 50-50 viewpoint of competing viewpoints, even if one of those viewpoints is by and far in the minority. 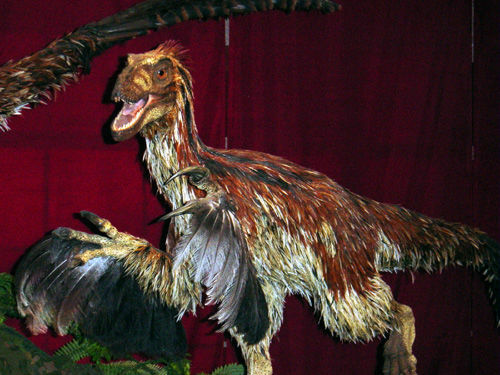 One of the arguments posed by Feduccia, which anti-evolutionists have taken and run with, is that some of the early feathered theropods don’t really display feathers at all, but rather collagen fibers. Of course, this argument pertains specifically toSinosauropteryx (not the entire line of feathered theropods). Here is a quote from a National Geographic article, Feathered Dinosaur Was Bald, Not Bird Ancestor, Controversial Study Says article evolution-deniers seem bent on referencing. I highly suggest reading the entire article, since this is the type of article anti-evolution sources tend to quote mine in pretense that it “disproves” evolution, when in fact it does no such thing. So there you have it. Feduccia’s explanation of later feathered theropods is that they are actually birds which have lost their ability to fly. So Feduccia himself admits that there is a resemblance between birds and theropods, and the argument that birds did not descend from theropods is by and far in the minority (as the article itself states). What anti-evolutionists are doing is cherry-picking what works for them and leaving out the rest. As to why the theropod-bird relationship makes more sense to me, simply put, the blanks are mostly filled in. 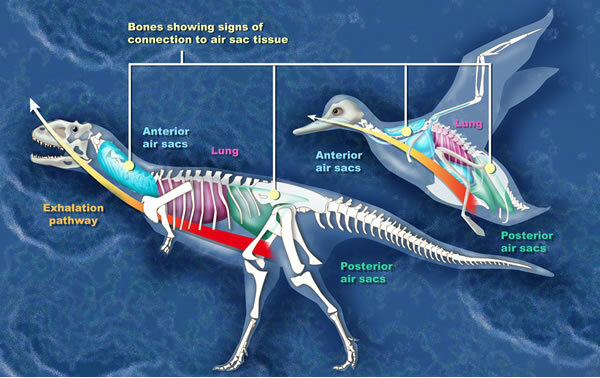 As the theropod lineage has become better understood, it’s been discovered that theropods also had hollow bones as well as lungs similar to modern birds. In addition to the intermediates in the fossil record, we also find modern birds possessing reptilian traits we wouldn’t predict had we not known about them. Both ostriches and hoatzin nestlings have small remnant claws. This makes perfect sense in the light of evolution, which states that they must have evolved from clawed vertebrates. It makes no sense in light of the “created kinds” argument. 1-Why weren’t other birds created with claws? 2-Why are these claws so undeveloped? These are really examples of the “living intermediates” anti-evolutionists claim don’t exist. Fossilization is a rare occurrence. Given the requirements needed for a dead specimen to become fossilized before becoming host to scavengers, erosion, and other forces that can destroy an animal’s carcass, it’s amazing we have as many transitional fossils as we do (so far 8 Archaeopteryx’s have been found). It’s important to understand this, because there is no way of knowing whether Archaeopteryx is in fact a direct ancestor to modern birds, or a close relative thereof. What’s important is that it appears in the layers after the first reptiles, and before modern birds, and that it contains physiology of both. “There is a common misconception that evolution means “upgrade” or improvement, as opposed to the adaptation to specific environments. This fallacy is often used in reference to the dodo bird, which of course, was flightless. Hence, many anti-evolution sources claims that this is de-volution, which disproves evolution which supposedly states that everything is getting better (which is not what evolution ‘states’). Dodo birds found themselves in a nice little niche on Mauritius Island, where food was plentiful on the ground, and the general lack of predators made flight less of a necessity. Because of this, excellent flight capability was no longer needed to ensure reproduction and the passing of its genes (much in the same way that our eyesight is getting worse because poor eyesight is no longer a one-way ticket to being eaten by leopards or bitten by cobras). Of course, man’s arrival brought new predators (including man himself) as well as scavengers which brought aboutcompetition for the dodo bird, leading to their extinction. So there you have it. That’s virtually the entire laundry list of anti-bird evolution arguments on the current anti-evolution market (at least that I can think of). Some of them might seem silly, especially to those with an understanding of Paleontology or Biology, but rest assured, these are real arguments passed around by anti-evolution sources. Given the amount of them, and the depths at which they must be explained to the person who doesn’t necessarily have the time or resources to learn all of this, I’m sure you can understand why I chose to stick to this one transitional sequence. Rest assured, the evolution-deniers have similar laundry lists against the evolution from apes to humans, land mammals to whales, lizards to snakes, fish to amphibians, etc. The shortest route to understanding the absurdity of their claims is to have a deep understanding of the fossils that have been found (since anti-evolution works mostly by conveniently leaving out pesky facts that you can easily learn from real science sources).